Subjects, styles, advertising, other relevant information: John Slater was a professional photographer and a professional developing and printing manager who specialised in D and P services for professional photographers. 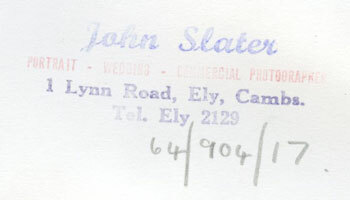 John Slater was at 1 Lynn Road Ely in around 1956. These were premises which were previously the Ely studio of Starr and Rignall and John Slater may have been an employee of the firm before taking over the studio and running developing and printing there. 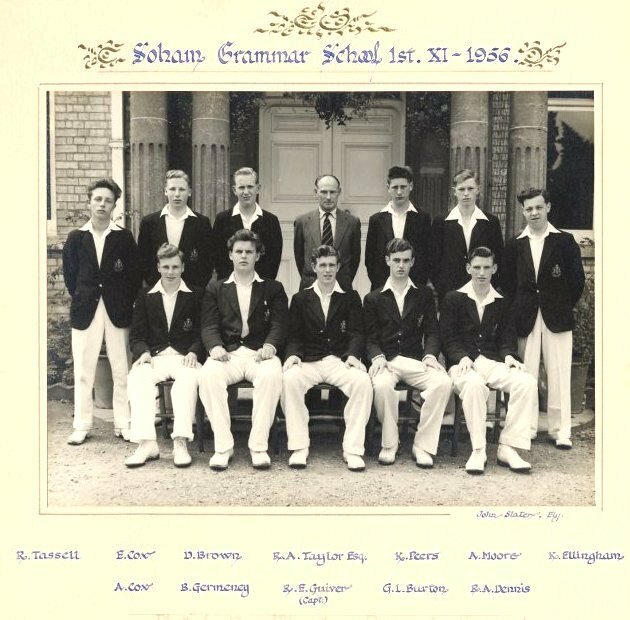 This image from Soham Village College www.sohamgrammar.org.uk/sg-cricket-X1-1956.jpg bears his name and is from that year. There are a series of similar photographs of Soham Grammar School teams up to 1966 with the photographer’s name "John Slater Ely”. Paul Godfrey has been researching D and P works and photographers in the Yarmouth area and advises us that John Slater expanded his business into that area in the late 1960s, competing with local firms for colour and black and white work. He has kindly allowed us to make available here his notes on one particular building in Gorlestone which was taken over by John Slater. John Slater published a series of his photographs of Newmarket in "Newmarket, Home of Horse Racing A Pictorial Study", John Slater and Peter Osborn, 1968, Landmark Press, Lavenham, Suffolk. 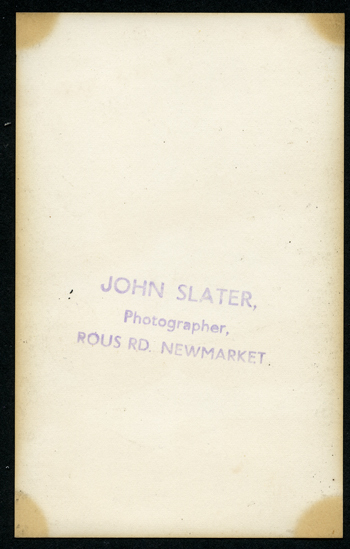 The Acknowledgement page states, "John Slater established a photographic business in Newmarket in 1946 and soon gained an international reputation as a photographer of horses, and particularly in East Anglia, a similar reputation as a general practitioner in photography. In 1966 a new company, John Slater Photography Ltd was formed. They acquired the old Maltings and transformed it into a well designed and highly efficient modern photographic processing laboratory. Now company vans travel daily over 1200 miles to bring a first class service to dealers and other photographers in East Anglia. We acknowledge the very great help and co-operation we received from the Company's Directors and staff and in particular from Max Warwick, the Professional Director, who undertook the no small task of assembling the photographs". 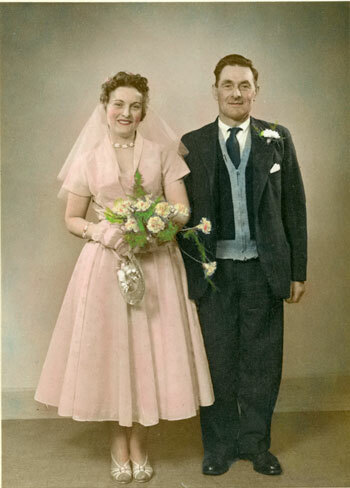 The two wedding photographs below are from the 1950s and show excellent skills in hand tinting. The prints are 6 x 4.5 in mounted of cream wrap round mounts with silver detailing and "John Slater Ely" in silver in the lower rh corner of the mount. 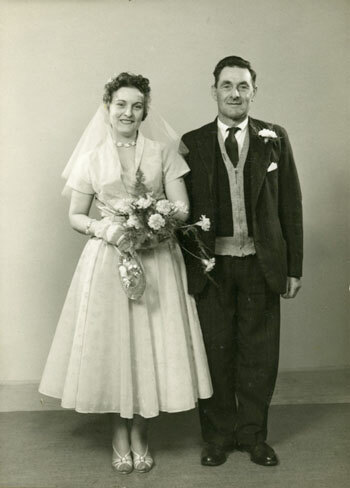 The next wedding photograph is a 10 in x 8in print from the early 1960s. Next to it is shown the John Slater backstamp "John Slater portrait, wedding, commercial photographer 1 Lynn Road Ely Cambs tel Ely 2129". 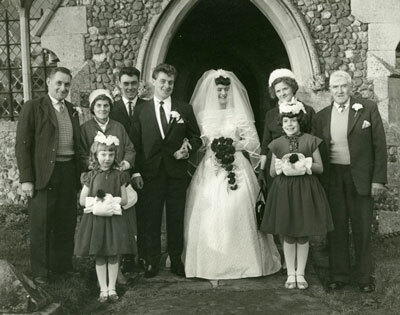 The third wedding photograph below, 5.5 x 3.5 inches, is from the mid 1960s and has a backstamp printed in blue, from a rubber stamp, “John Slater, photographer, Rous Road, Newmarket”. John Slater was active in Newmarket at least from 1963 when he photographed a special cake for Newmarket trainer Reg Day's 80th birthday. www.newmarketshops.info/No.125_High_Street.html. It is believed that as a Newmarket photographer John Slater took a lot of photographs of racehorses. Cambridge Yellow Pages 1980-1983 show John Slater as a photographer at The Maltings, Fordham Road, Newmarket. A number of different photo processing laboratories which were connected with John Slater have operated from this address and appeared in the Cambridge Yellow Pages: Colorlabs International Ltd, (1980 to at least 2000), Colorlabs Professional (1990 - 1998), Lichfield Laboratories (with involvement with Lord Litchfield - 1985 - 1990), Miniprints Ltd (1995 - 1998), United Photographic Laboratories Ltd (1982 - 1985). John Slater was also at different times involved in regional and national management of the WPFA (Wholesale PhotoFinishers Association) and later the APL (Association of Photographic Laboratories). Subjects, styles, advertising, other relevant information: In 1911 Norman was living with his widowed mother Kate, brother Percy, sister Winifred and cousin Alvar Branson at Church Street Sawtry - no occupation was shown for Norman. His brother Percy was a photographer and his cousin was a carpenter. Norman Slater appears in the 1939 Register listed as a photographer. 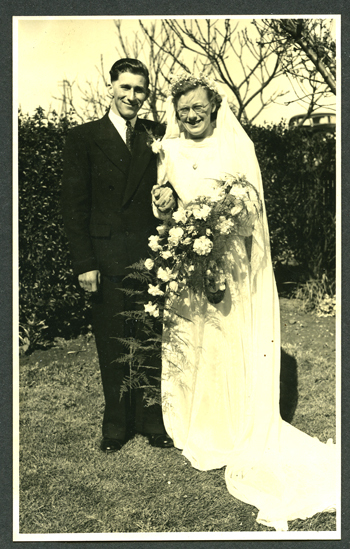 At the same address was his wife Agnes MM Slater b: 7/3/1897 and Joan S Wootton (Dunfold) b:26/11/1926. Norman was the younger brother of Percy John Slater (below). It is not known whether the two were in business together or separately. Subjects, styles, advertising, other relevant information: Percy Slater was born in Sawtry, the son of John Slater b:1837 Cleckheaton, Yorks, a man living from private means and Kate Slater b:1858 Sawtry. In 1891 Percy was living with his parents at Sawtry, with his brother, Stanley G, b:1880 and sisters Mabel, b:1882, Gertude M, b:1883, Florence, b:1886, Irene M. b:1887, brother William E.D, b:1888 and sister Annie b:1890. All the siblings were born at Sawtry. In 1901 The family was living in The Church, Sawtry. Kate was shown as the head of the household. Percy was listed as a postman. Living in the household were Irene, William E. D., Annie, Winfred b:1893 and Norman b:1894. 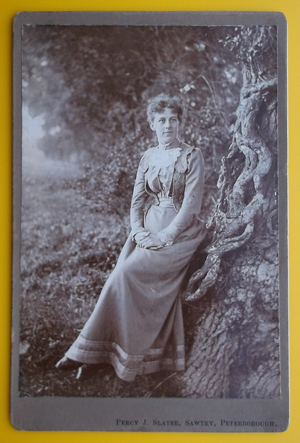 Percy first appears in the Huntingdonshire Kellys Directory as a photographer in 1906, but by his own account started in photography in the early 1890s. In April 1903 Percy advertised his photo printing services in a number of Surrey Newspapers, offering "A nicely finished platino-bromide enlargement from any photograph packed post free for 4 shillings". In 1911 Percy was still living with his then widowed mother, Kate, at Sawtry. Percy was a photographer working from home on his own account. Also in the household were fellow siblings Winifred and Norman and a cousin Alvar Branson, a carpenter. In the 1939 Register Percy was living at The Green, Sawtry with his wife Rose E b: 24/7/1880. His occupation was listed as a photographer. The first three photographs below were purchased by the author locally as having come from the Percy Slater collection. These appear to pre-date the earliest date shown above for Slater's trade directory entries. There are a number of possibilities. Did Slater operate as a photographer before turning professional or was he operating for a number of years before being picked up in the local trade directory? The photos appear to be contact prints approx 4in x 3in format. The first two show an assembly of people about to set off on, or having just finished, a march or parade. There is a banner for Burlington Oddfellows Lodge. It is believed that this photograph was taken in Sawtry and the band members are from Sawtry Brass Band. 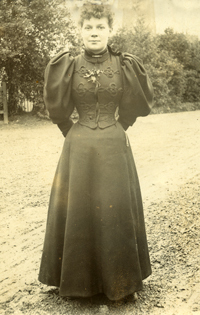 The third image is of an unidentified lady - the leg-of-mutton sleeves on her dress indicating the 1890s rather than the early 1900s. The next photograph is a cabinet portrait from the Simon Shirley Collection of an unknown lady posing beside an ivy clad ancient tree, definitely an out-of-studio shot. The grey mount is inscribed "Percy J Slater, Sawtry, Peterborough". The reverse is blank. This appears to date from around 1900. The next photograph shows just how valuable Percy Slater was in recording his local village environment. 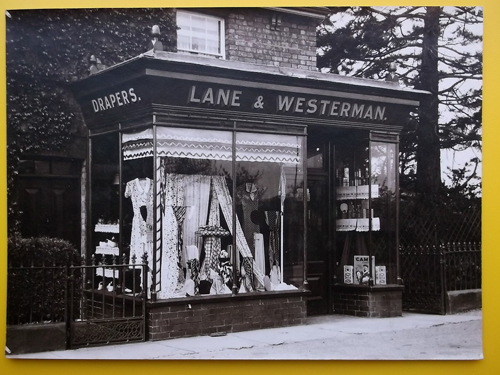 It is a 6 x 4 in photograph from the Simon Shirley Collection of the wonderful shop front of Lane & Westerman - listed in Sawtry as Grocers & Drapers from 1890 to 1924 and Grocers only from 1928 to 1936. The picture shows the drapers to the left and the grocers to the right, so pre-dates 1928. Interestingly the Huntingdon Record Office also has Percy Slater family photographs some of which pre-date the years above. These include 1930s photographs of crashed cars, presumably from the nearby A1 probably taken for the local press, as well as events, groups and portraits. The Peterborough Advertiser - Friday 25 May 1956 p8 carries an article on the village of Sawtry "Village Life Has Changed" which included material from an interview with Percy Slater: "Percy’s father. John Slater, was a Yorkshireman. His mother. Kate, came from Sawtry and they had four children Percy was the eldest and he went to the village school until he was 17. He chose photography as a career and in the early 1890’s built himself a dark room at his house on the green and started up in business. Graduating from parties and wedding groups in the village, he took on trade developing, printing and enlarging for Peterborough firms and soon his name was well known in the district. A future was assured. During the first World War he entered the photographic section of the Royal Flying Corps when he did printing and enlarging work for observers and pilots. Returning to his native Sawtry he married a girl, Rose, who had come to live In the village from Coningsby in Lincolnshire." 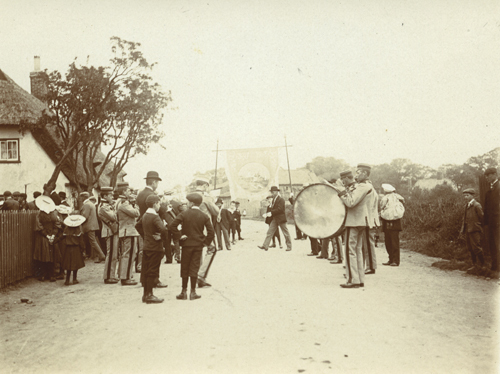 Sawtry - a parade with Sawtry Brass Band and Oddfellows Banner, c 1900? 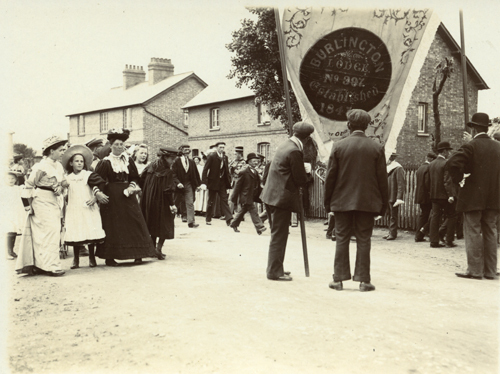 Second shot of a parade at Sawtry with the Burlington Lodge banner c. 1900? Subjects, styles, advertising, other relevant information: In the 1939 Register Percy is shown at the above address as a travelling photographer , married to Emily Slingsby b: 14/11/1890, also in the household was Henry Slingsby b: 1920 a garage clerk. No further details known.